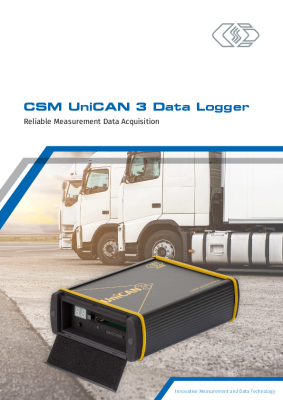 UniCAN 3 CAN Data Logger | CSM Products, Inc.
As a further development of the proven UniCAN 2 stand-alone data logger, you will also be very well prepared for future measurement tasks with the CSM UniCAN 3 data logger. As already known from the UniCAN 2, the UniCAN 3 optionally supports various CAN protocols (CCP, XCP,...) and software extensions (CANsend, CAN stimulation,...). The recorded data can be transmitted via LTE or WLAN, alternatively also locally via network (LAN), USB or by changing the CF card. The firmware detects power supply cuts and the removal of the CF card during data recording. No data recorded up to this time will be lost. Data recording is resumed automatically as soon as the card is re-inserted and the power supply restored. CAN messages and signals, each up to a maximum of eight separate groups, can be recorded in parallel. Each group has individual trigger and filter criteria and can be used as linear or ring buffers. Wide trigger criteria and pre- and post-trigger ranges can be defined per channel/message group. As the capacity of the CF card is the only limit to the size of a pre-trigger, the occurrence of a trigger event can practically contain any amount of trigger data. Edge, gate and flip-flop trigger modes are available. 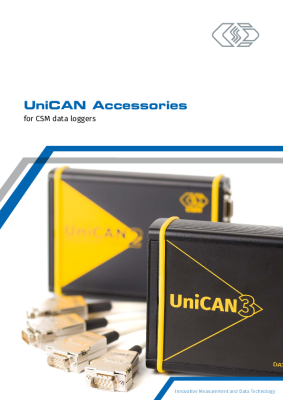 In contrast to data loggers with standard file systems, the write access of a UniCAN 3 logger to a memory card is not affected by the increased segmentation of the memory device. The data is compressed during recording. If the internet is used for data transmission, data integrity can be ensured by using the ftp command XCRC. SSH2 provides protection against data theft and data corruption. Data can be transmitted via LTE modem while data recording continues without interruption. 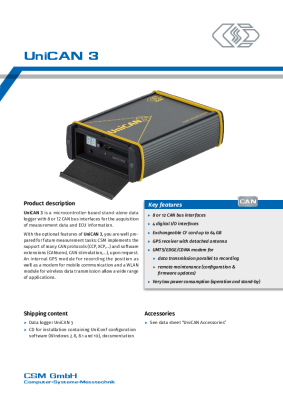 Measurement data can be read directly from the CF card or remotely via modem/FTP server (data formats are, for example, MDF or ASCII). For maximum data security, the data transmission is binary. Data transmission can be performed after “ignition off” or according to a predefined schedule, e.g. every hour, while the data recording process continues to run. Data recording starts approximately 600 ms after “power on”. The logger stands out for its very low power consumption in stand-by mode. A delay between ignition and the start of data recording can be specified. A wide range of functions is available for data transmission to effectively integrate the post-processing of UniCAN 3 recorded data in your internal processes. Due to the use of the LTE modem and WLAN, data can be transmitted while the recording of data continues. The interfaces can also be used to change the logger configuration during operation. If remote data transmission is not desired, the data transmission can be carried out via network (LAN) or simply by changing the CF card. 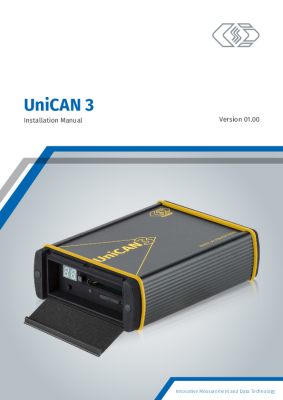 The UniCAN 3 provides various options for data transmission.